Above: Dawn comes to Sprague Lake in Colorado’s Rocky Mountain National Park, where West Des Moines photographer Whitney Rounds waits to discover what the light will reveal. “You want to be there before the ducks wake up,” he says. Photographer Whitney Rounds (right) moves carefully, purposefully, settling into position. This spot was chosen from previous visits. He sets up his tripod, camera and lens—and he waits quietly for the advent of dawn. As daylight eases over the landscape, Rounds studies the scene before him, watching the golden glow wash over plants and creatures that thrive here. The location can be an Iowa prairie, pond or river. At other times it has been high in the Rockies or deep in an Asian jungle. The quest is always the same: to capture a moment of life in the wild, bathed in rich light, framed in careful composition, a photographic image of perfection. “Once you get into it, it kinda grows on you,” he says with the soft drawl of his Texas youth. He has no illusions of perfection, but agrees that it’s a worthy goal. 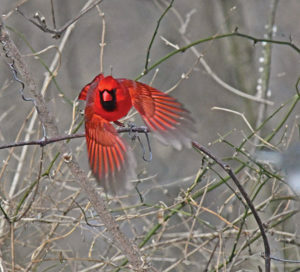 On chilly mornings, Rounds often wears a camouflage-patterned rainsuit to more comfortably await moments like this, as a cardinal lifts away from a perch in Walnut Woods State Park. Animal subjects may come naturally to him. He has a Ph.D. in animal nutrition and works as a senior technical service manager for Kemin Industries, a worldwide enterprise based in Des Moines. That career, focused on beef, carried Rounds to far-flung sites where he got serious about photography as a way to document his travels and fill idle hours far from friends and family. Packing along one of his Nikons gave these walks extra purpose, snapping shots for practice or to record sites worth revisiting. Hiking around Raccoon River Park near his West Des Moines home, Rounds notices animal tracks, gatherings of birds, interesting shadows. He notes where and when animals are active. He determines the direction of sunlight on each site throughout the day. Nature photos are seldom the product of serendipity, stumbling onto the right combination of subject, setting and light (plus the perfect match of lens aperture and shutter speed). Luck has its place, but successful photographers rely instead on planning, persistence and patience. “The thing you learn is, you may have to go into the same area for five, six, seven times before you understand what’s there and the angles for good shots and the timing of the light,” Rounds says. Pelicans preen and socialize at Raccoon River Park’s remote back ponds, “way through the woods where most people don’t bother to go,” Rounds says. Webs come to life in the damp air of a dewy or foggy morning, as seen here stretched among twigs and petals in West Des Moines. Flora and fauna fascinate Rounds, from herons at Raccoon River Park in West Des Moines to orchids at a botanical center and columbine in Colorado. Practice helps. Rounds estimates he has logged as many as 50,000 images. He started with film—“a lot of film,” he says—but has grown to appreciate the immediacy (and economy) of digital images. “Everything I know, I taught myself,” he says, acknowledging that he would like to learn more about creative manipulation to enhance digital images. But the basics serve him well: study, plan, persevere with patience. It’s a solitary passion, but not a lonely one. Rounds shakes his head, recalling typical nature hikers who bash along a trail, talking and laughing. “You can hear them a mile away,” Rounds says. They might have enjoyed a nice walk, but wildlife zips away at the first hint of commotion. 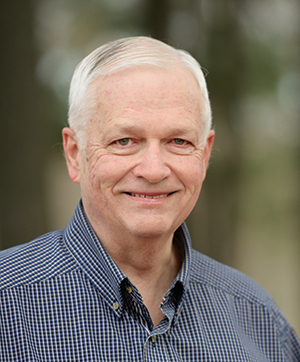 These days, Rounds enjoys life as a perpetual student of nature. He watches swans at Maffitt Lake and, he says, “I’ve been doing a lot of background study on owls.” His latest interest has been photographing flight—capturing the alignment of feathers, the speed of motion while using depth of field to isolate the subject bird from its background.